The Al-Ghazali Endowed Distinguished Professorship will support Professor Cyrus Zargar in growing the Islamic Studies program at UCF. 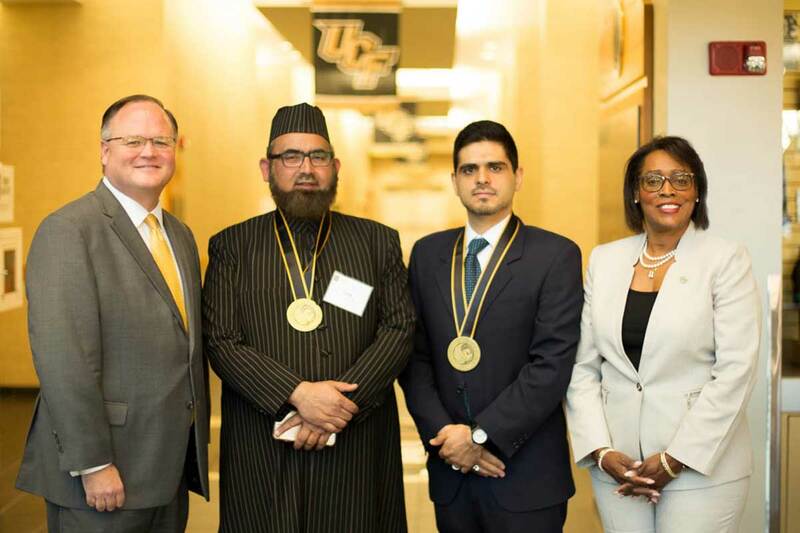 UCF philosophy Professor Cyrus Zargar last week was invested into the newly funded Al-Ghazali Endowed Distinguished Professorship. The position recognizes Zargar’s accomplishments and will allow him to advance his research, pedagogy and community outreach in the area of Islamic Studies. For Zargar, this means furthering his long-term goal of building connections among students and faculty to talk about religion, theology and social issues. “I hope to make UCF a center of discussions—a center of learning where scholars and artists from around the U.S. and the world are heard by a curious and participating campus community,” says Zargar. Zargar, who joined the UCF faculty last fall, has already made moves in advancing UCF’s Islamic Studies program. He hosted two public events in the fall, including a showing of the award-winning Iranian film The Color of Paradise, and is working with the university to create a new certificate in interfaith studies. His long-term goal is to build connections among students and faculty to talk about religion, theology and social issues. UCF Provost Elizabeth Dooley and College of Arts and Humanities Dean Jeff Moore presided over the investiture ceremony, which was held on Wednesday, Jan. 16, at the UCF FAIRWINDS Alumni Center. The event was attended by many members of the Islamic Center of Orlando, including Imam Tariq Rasheed. Rasheed, a UCF alumnus, led the charge in creating the new position by encouraging the financial support of hundreds of members of the Islamic Center. The Al-Ghazali Endowed Professorship was started in 2005 and the Islamic Studies program in 2011 with the overall goal of promoting the understanding and appreciation of Islam and Muslim communities. Learn more about the Islamic Studies program and Zargar at philosophy.cah.ucf.edu/islamic-studies.